Home Costs > How Much Does Dredging Cost? The term “dredging” refers to the process involving the aquatic excavation of water beds to remove sediments, pollutants, shellfish and other materials. This can be done for a number of reasons: it can deepen waterways, create harbors, channels, locks, docks and/or berths. Dredging is also essential in de-silting lakes and keeping river entrances and approaches to boat ramps clear. Dredging is a very broad term since the degree of the job varies considerably. Because of that, the costs are not fixed and it can be hard for a contractor to offer you a quote over the phone. If the job you want to finish is just about deepening a drainage canal, you can simply use a big bucket and do it from the bank of the canal. For this kind of work, costs can be around a few hundred dollars per hour; however, if the job is much more complex than restoring the canal depth, such as deepening a shipping channel or a harbor, expect higher costs. Major jobs like these, which require heavy machinery, will cost thousands of dollars per hour and can go higher, depending on the job and what is required to do it. The costs, in the end, will depend on the material that needs to be dredged, where the material can be placed once out and the nature of the material that’s being dredged. From the quotes we have seen online, it can be anywhere between $5 to $20 per cubic yard. Because every job will be so unique, highly consider getting quotes from local contractors in your area from reputable contractor websites such as HomeAdvisor.com. Here, you can explain your job and local, licensed contractors can contact you with free estimates. Dredging101.com, for example, shows us how the dredging work is priced. According to the site, the work is usually priced by the cubic yard of the material that’s going to be dredged. When determining the cubic yards, take the acres to be dredged and multiply 1,600 cubic yards per foot of material depth. So for example, if you have a 10-acre lake and the depth of material to be dredged is five feet, your formula will look like this: 10 x 5 x 1,600 = 80,000 cubic yards. If we take the estimates provided, this scenario could cost more than $600,000. A recent dredging job completed at Marco Island’s South Beach amounted to $630,000. The entire area was not only excavated, but the beach was extended about 80 feet into the Gulf of Mexico, adding 77,000 cubic yards of sand and had repaired five erosion-prevention structures: three jetties and two T-groins. For other recent dredging projects, you can visit Dredgingtoday.com and look for the exact costs associated with each project. As mentioned the subheading above, the square footage and depth of the water will determine the cubic feet, and this is how most contractors will start their quote. We get into this a bit later, but when the sediment is removed, it will need to be placed somewhere to allow it to be de-water so it can be disposed of later. Most contractors will prefer a flat and open area where they can potentially create a pad to place the de-watering bag. How accessible is your situation? Is it in the middle of an open field, or are there multiple houses along the shore? The harder it is to access the lake, the harder it will be to work with the equipment. Are you going to get the permits, or will the contractor have to contact and secure them for you? These permits can be a bit trickier since they will have to work on both a local and federal level. Dry will involve draining the lake as much as possible, followed by dewatering the sediments by gravity and/or pumping the sediments with equipment such as a bulldozer or backhoe. 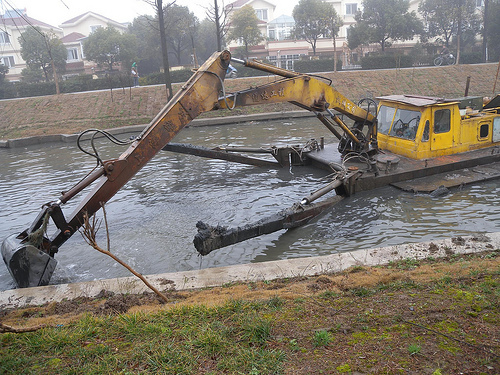 During the wet excavation process, the lake is partially drawn to help minimize the downstream to excavate the sediments by using a buck dredge mounted on a crane. The hydraulic process will involve using floating equipment, combined with the use of a cutter head to help loosen up the sediment on the bottom of the water. During this process, the sediment will be pumped out as a wet slurry and will later be de-watered, allowing the remaining sediment to dry out and be disposed of later. The pneumatic dredging process will use air pressure to help pump the sediments out of the lake. When compared to the hydraulic process, the sediment derived will have a higher solid rate, meaning less area will be needed to help the sediment de-water. Lastly, the reverse layer process can often be combined with dredging because it involves the movement of sediment, but unlike the other processes, it won’t entirely remove the sediments from the lake. The substrate, during the reverse layer process, will be pumped upward, burying it underneath the muck, essentially creating a new healthier layer. Most contractors will ask for a pond assessment before they even start the job. If you haven’t had one done yet, then this can be an additional cost to think about. Depending on the factors mentioned above, a pond assessment can range from the hundreds to well into the thousands. Dredging processes are extremely complex, and because of this, almost all states will require you to pull local and even federal permits for approval. During the dredging process, the sediment that’s removed needs a place to put it. According to this article on LinkedIn.com, you should be prepared to have an acre of an upland area for every two acres of water that needs to be dredged.